But four wrongs sometimes do. Murray Hill. 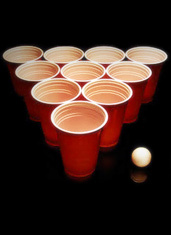 Beer pong. Pizza bagels. St. Patrick’s Day. Introducing Bagel Beer Pong at Vic’s, a Midtown bagel bar that’s hosting after-hours bouts of Beirut sustained by gourmet flights of crispy pizza flagels, debuting for UrbanDaddy subscribers only on St. Paddy’s Day, and before an unsuspecting public next week. Basically, this is your first (and possibly only) option for competitive prime-time drinking that doesn’t include obscure trivia or mixed doubles karaoke. You’ll venture here under the cover of night, where Tuesday through Saturday all the schmearing/loxing operations cease, and an otherwise ordinary bagel store transforms into an underground sports arena. First, you’ll immediately call and reserve one of the six hand-painted tables for Thursday. Because while we think people may want unlimited beer on St. Pat’s, we’re pretty positive they’ll want unlimited bagels. Then, upon arrival, you’ll be supplied with all the necessary equipment. Ping-pong balls. Iced coffee cups masquerading as red Solos. Personal waiter to keep your pitchers topped off with seasonal beer (apparently Coors Light peaks in March). And by order of UD Perks, your beer pong butler will spend the next two hours not only filling cups, but also supplying an infinite stream of toasted pizza bagels tableside. Think Margherita, Meat Lover’s and the barbecue chicken, pepper jack and cilantro Dallas Pizza bagel. These are dark times for poppy seeds.